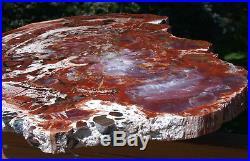 This is the single largest slab we’ve yet cut from this incredible petrified forest! It’s hard not to love the beautiful natural color in this amazing fossil wood and this piece is as big and colorful as they get! Whether displayed on the wall as art or used as the top for a stunning table, this piece will provide a lifetime of wonder for all who stare into its mirror polished surface! The black agate shades laced throughout the face of this beautifully polished stone provide a gorgeous contrast to the rich array of brilliant 100% natural agate shades. The color in this magnificent specimen simply has to be seen in person to be truly appreciated – it literally glows and it clearly shows where Arizona “rainbow” wood gets its fanciful name! The stone was pricey, but it had such dramatic colors in a nice displayable size that I couldn’t pass it up! This log produced some of the finest and visually captivating Arizona Rainbow specimens you’ll find with truly remarkable natural color. It’s the kind of specimens that explains how this wood earned its name! 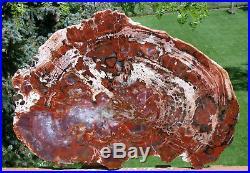 The log is very nicely agatized and took a magnificent polish to bring all of that amazing color to life as only the best grades of petrified wood can. This looks to be an Araucaria (an ancient conifer). The deep red, orange, purple and yellow combine with the ancient wood grain to make a stunning display piece! We don’t offer it often – but when we do you know it’s a great piece! I don’t often get top grade examples of petrified wood from Arizona and what I do see is usually table top size and not very easy for a collector to display. This particular log is an exception to both rules. I didn’t find it, but I sure wish I had! It’s one of the better preserved medium sized petrified wood logs I’ve seen from that state and deserves a place in your collection as well. Most of the petrified logs found in this particular area are Araucaria, and the structure in this one is consistent with those. The cell structure of most of these super old conifer like trees are very difficult to separate just in cross section no matter how well defined they are and this one is no exception. If you’re new to our shop the one thing you should expect is to see an unexpectedly glossy finish on each stone we prepare. This complete round is a wonderful example of the best lapidary work you’ll find. It’s been cut with a diamond saw and flat lapped on equipment I built myself to produce a mirror perfect polish unmatched by any of our many would-be imitators. The detail captured and revealed through the highly polished surface is just immaculate. It’s easily some of the best fossil wood to be found anywhere! The rings are gorgeous, the agate is highly polished and the detail is easier to see in person than the photo suggests. It’s a truly special find and we won’t likely have a lot more so get a piece for your collection while it’s available! This is a thick slab from the center of the log and measures about 20 1/2″ x 14 3/4″ across the polished face. It is cut about 0.78 thick. A nice, unique natural wonder collectible exclusively from Sticks-in-Stones Lapidary! The item “SiS BIG BRILLIANT RAINBOW 21 Gorgeous Arizona Petrified Wood Round TABLE TOP” is in sale since Monday, May 14, 2018. This item is in the category “Collectibles\Rocks, Fossils & Minerals\Fossils\Vegetation\Petrified Wood”. The seller is “rockshop” and is located in Beaverton, Oregon. This item can be shipped worldwide.